A Virginian by birth, Houston was sent to Texas in 1832 as President Andrew Jackson’s emissary in negotiating Indian treaties there. He decided to settle in Texas in 1833 and became a leader of the rebellion against Mexico—which governed Texas—beginning in November 1835. Houston commanded the small Texas army, which, despite early reverses, triumphed at the Battle of San Jacinto on April 21, 1836 and won independence. 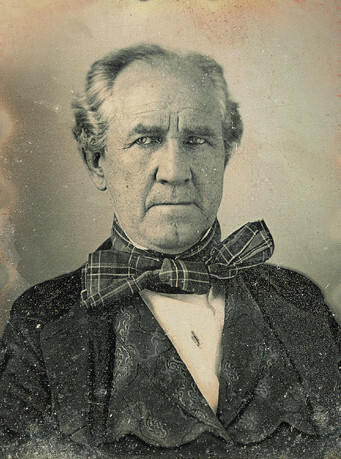 Houston served as president of the Republic of Texas from 1836 to 1838 and from 1841 to 1844, then as one of the first two senators, after Texas was admitted to the Union in 1846. As a majority of Texans voted for secession on the eve of Civil War, Houston lost his bid for reelection to the Senate in 1858, but was elected governor in 1859. His efforts to prevent secession failed and, in 1861, he refused to swear allegiance to the Confederacy, whereupon he was deposed and lived out the rest of his life in quiet retirement.